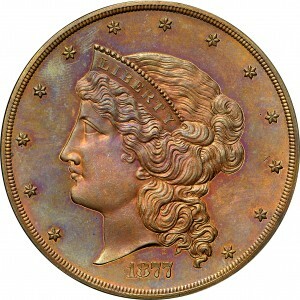 This is the famous half union or $50 gold coin with a head of Liberty wearing a coronet as designed by William Barber. 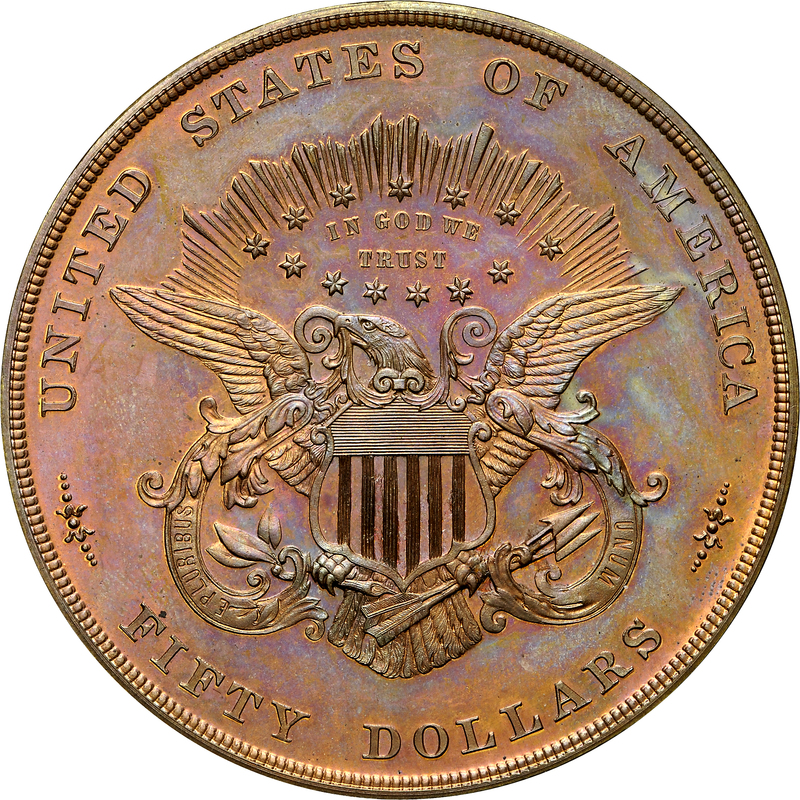 The reverse design is virtually identical to the double eagle design originally prepared by James Longacre many years earlier. 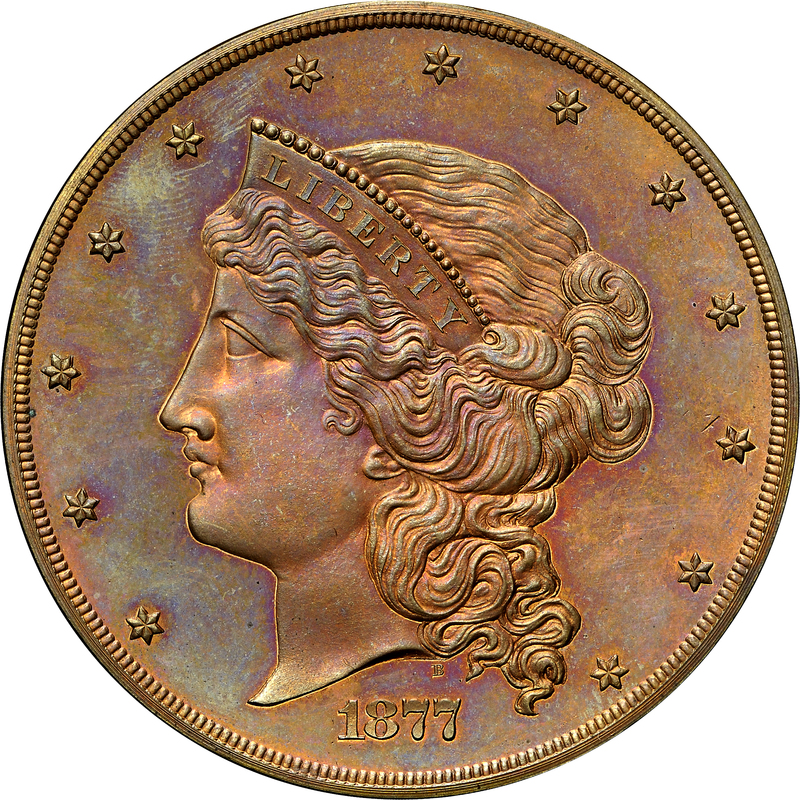 Examples were struck in gold and copper in each of two different varieties. Both known gold examples, one from each die combination, are in the Smithsonian Institution. Only eight or nine examples of each variety are known in copper. This Bass Collection coin ranks as one of the finest survivors. From Stack's sale of the DiBello Collection, May 1970, Lot 510. Head of Liberty to left, coronet in hair reads LIBERTY, 13 stars around, date below, small B, for William Barber, in field above date. 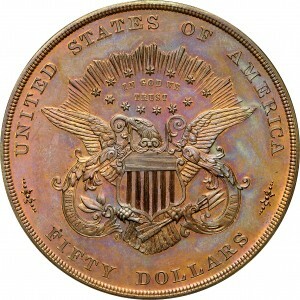 Very similar to the standard reverse of the regular-issue double eagles of the era, central eagle with outspread wings, rays and halo of 13 stars above eagle, IN GOD WE TRUST within halo of stars, E PLURIBUS UNUM on ribbon that encircles eagle, UNITED STATES OF AMERICA FIFTY DOLLARS around.